BlueScope Water are experts in rainwater harvesting for residential use. They produce a stylish and space saving range or rain water tanks made from BlueScope Steel Aquaplate steel: the Waterpoint range. Waterpoint urban rain water tanks provide an efficient solution for the capture of rain water for both indoor and outdoor use; for watering the garden, washing clothes or flushing the toilet. Available as the Waterpoint Slimline oval shaped rain water tanks and as Waterpoint Classic traditional round storage tanks, they are versatile and can easily be installed in restricted spaces. 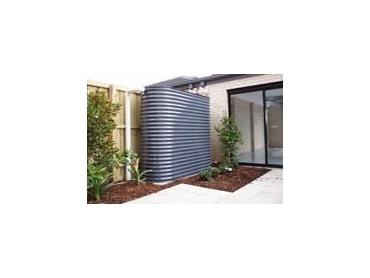 These rain water tanks are available in a range of Colorbond steel colours. Waterpoint urban rain water tanks are available from Pioneer Water Tanks .